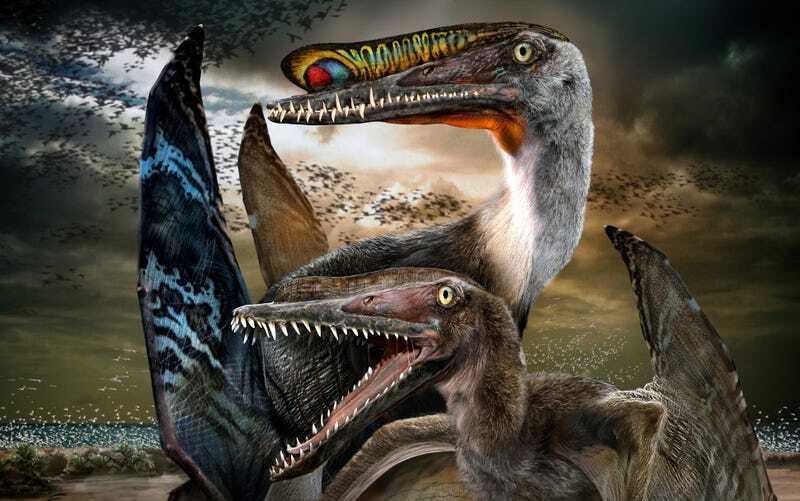 Well-preserved fossils of pterosaurs are extremely hard to come by, which makes this recent find of 40 male and female individuals all the more incredible. Along with the discovery of a spectacular new crested species, paleontologists have also found the first 3-dimensional fossilized pterosaur eggs. Say hello to Hamipterus tianshanensis, a newly documented species of pterosaur that lived 120 million years ago during the Early Cretaceous Period in what is now China. The 3D eggs were found among dozens — possibly hundreds — of pterosaur fossils, an indication that they were a highly social species living together in bustling, gregarious colonies. Hamipterus was a medium-sized pterosaur featuring wingspans up to 11.5 feet (3.5 m). They belonged to a group of pterosaurs called the pteranodontoids, which includes the toothless Pteranodon. Hamipterus was likely an excellent flier, primarily feeding on fish by snatching them from the surface of the water; the fossils exhibited a series of long teeth in the thin jaws. Sediments in the area indicate that the pterosaurs died in a large storm. Fascinatingly, Hamipterus featured a bony crest that ran along the top of the skull, one that varied in size, shape, and robustness among the individual specimens found. Pterosaurs are known for their crests, but paleontologists aren't entirely sure of their function. The going theory is that they were ornamental — a peacock-like display meant to attract mates. They may have also been used as a signal of social dominance, much like horns on various extant animals. In Hamipterus, the different sizes may represent males and females, with the males having the larger crest. Until now, only four pterosaur eggs had ever been found, all of them flattened. Analysis of the fossils suggest they were pliable, with a thin calcareous eggshell outside and a soft, thick membrane inside (similar to the eggs of some modern-day snakes). The layout of the eggs and pterosaur remains suggest the presence of a nesting site nearby; Hamipterus were likely quite social. They most likely buried their eggs in sand along the shore of an ancient lake to prevent them from drying out. Read the entire study at Current Biology: "Sexually Dimorphic Tridimensionally Preserved Pterosaurs and Their Eggs from China." Image: Chuang Zhao/Xiaolin Want et. al/Current Biology.